A little bit sweet, a little bit sour, this is the Raw Bar for a mid-afternoon pick-me-up! Made with Davidson Plum (my, what glowing, youthful skin you have!) and Riberry (my, how clever you are! 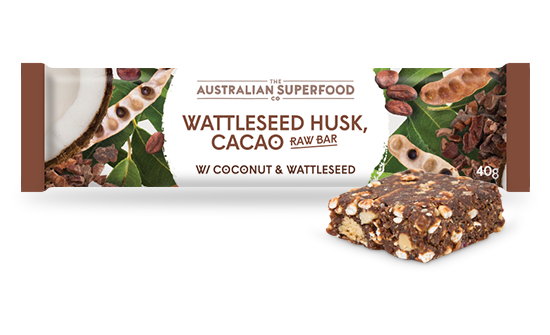 ), along with superfood favourites like chia, almonds, blueberries and coconut, keep a few of these on hand at ALL times! 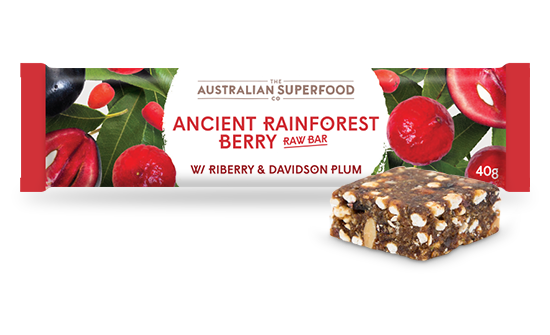 Made with the slightly sour Davidson Plum and the sweet Riberry, this is one of our favourite bars in the Raw Bar range. 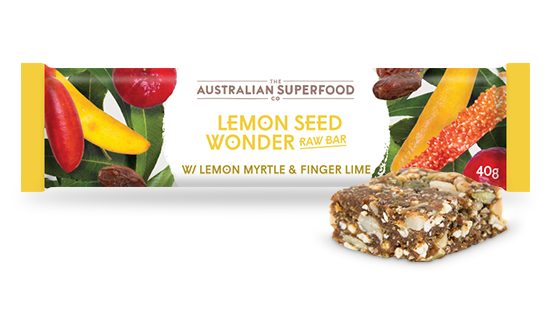 This is a great treat to keep in your desk drawer or gym bag for an instant energy boost! While quite tart, the Davidson plum is an antioxidant powerhouse, containing high levels of anthocyanin (the sort of antioxidants you need to keep your brain firing and your immune system pumping!). It’s also a great source of calcium (minus the dairy), Vitamin E and zinc (just what the doctor ordered when you said you wanted more youthful looking skin!). Dates, almonds, dried cranberries, coconut, native superfood blend (Finger Lime, Wattleseed, Davidson Plum (0.4%), Riberry (0.4%), Quandong (0.4%), Kakadu Plum), walnuts, sunflower seeds, dried blueberries, cacao nibs, puffed millet, sultanas, chia seeds, dried apple, corn fibre, natural flavour. This bar is quite morish. It has a lovely sweetness balanced with the sourness of the fruit. The nuts give some bite and the dates some chewiness. 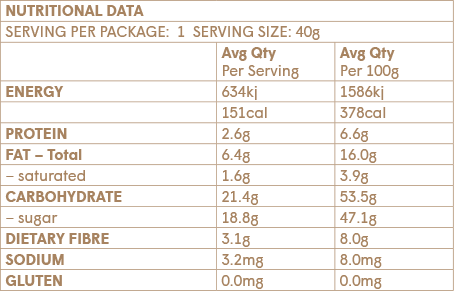 As a nutritionist I was happy to see the exclusion of sugar from the ingredient list and dates as the first ingredient. Id happily give these to my kids in their lunchbox or eat one myself for morning tea.